Small holed from exposed voids under the original surface of the tiles. 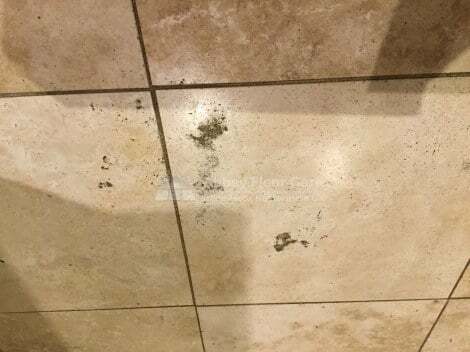 My client did not like the look of the floor because it appeared that it was never cleaned. Also, the floor did not match the other clean floors in the home. Once I finished, my client was delighted. I did not expect the floor to look this good. 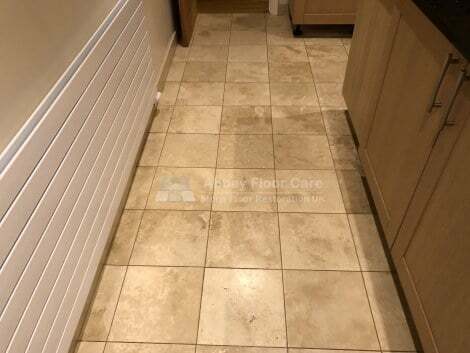 The floor looks much cleaner and nicer - thank you very much for your expertise. 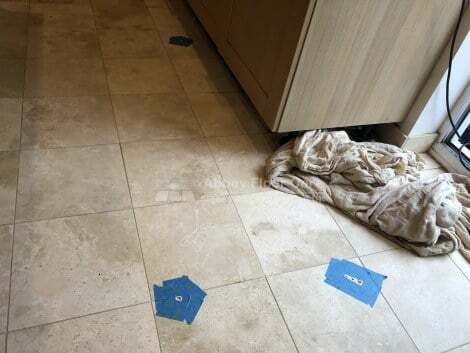 I started by deep cleaning the tiles and grout with a rotary floor machine and my Travertine Cleaning chemicals. The cleaning did a great job, but some ingrained soil was still remaining in the small exposed holes. So I pressure rinsed the floor to remove the remaining soil. I filled the larger holes with 2 part Jasmine colour hard filler. Before filling I prepared the repairs with protective masking tape. The tape minimises the amount of filler that needs to be removed once it is cured. Then I ground the filler smooth to the floor with a rotary sanding machine and diamond pads. I filled the smaller holes with Jasmine colour grout. Once the grout was dry, I removed the grout haze. The floor was ready for sealing. I sealed the floor with a mid-sheen film-forming sealer. Unfortunately, my camera ran out of power, so I couldn't take a photo of the finished floor. 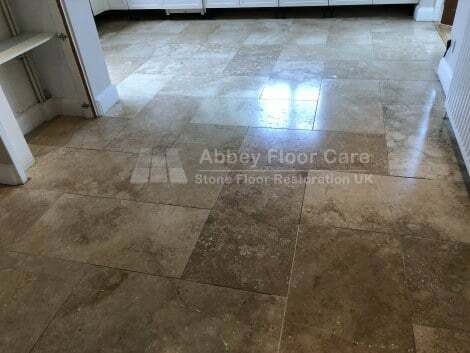 So I have included an image of a similar finish on a floor I restored in New Malden, Kingston upon Thames, to show the finish after sealing. I advised my customer to dry sweep and damp mop the floor with LTP Floorshine, available locally. Dry sweeping removes grit and soil. The cleaner contains polymers that help maintain the finish on the floor. 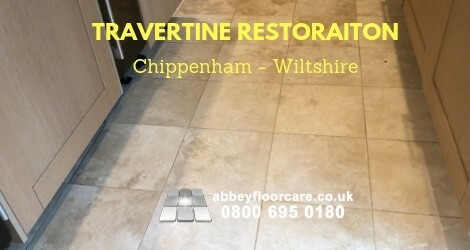 Look after your Travertine and it will cost less to restore, saving you money.